Grand Central Publishing, 9781455577590, 384pp. On one evening in Washington, DC, several high-ranking members of government disappear in a mass kidnapping. Among the kidnapped is Nick Rendel, a computer software coding expert in charge of drone programming and strategy. He is the victim with the most dangerous knowledge, including confidential passwords and codes that are used to program the drones. If revealed, his kidnappers could reprogram the drones to strike targets within the United States. JAMIE FREVELETTI is the internationally bestselling and ITW- and Barry Award-winning author of thrillers Dead Asleep, Running from the Devil, Running Dark, and The Ninth Day. A trial attorney with a diploma in international studies, she is an avid distance runner and holds a black belt in Aikido, a Japanese martial art. She lives in Chicago with her family. 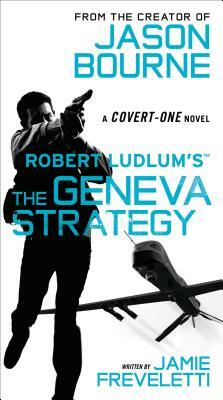 ROBERT LUDLUM was the author of twenty-seven novels, each one a New York Times bestseller. There are more than 225 million of his books in print, and they have been translated into thirty-two languages. He is the author of The Scarlatti Inheritance, The Chancellor Manuscript, and the Jason Bourne series--The Bourne Identity, The Bourne Supremacy, and The Bourne Ultimatum--among others. Mr. Ludlum passed away in March 2001. To learn more, visit www.Robert-Ludlum.com. "Award-winning novelist Jamie Freveletti lends her imaginative talents to the Covert One series with a book that is nearly impossible to put down and moves at the speed of light without pause...races forward with the energy of a super-charged Bourne film."